Blue Ice is the largest area, covered by thick snow and ice. It has blue slopes. Red Sun is a humid area covered with deserts, savannas, jungles and ancient canyons. It has red slopes. Green Leaf is overgrown with colorful forests and swamps. It has green slopes. Yellow Wheat is a place filled with fields, gardens and labyrinths created by magic. It has yellow slopes and is the only area adjacent to all other areas. 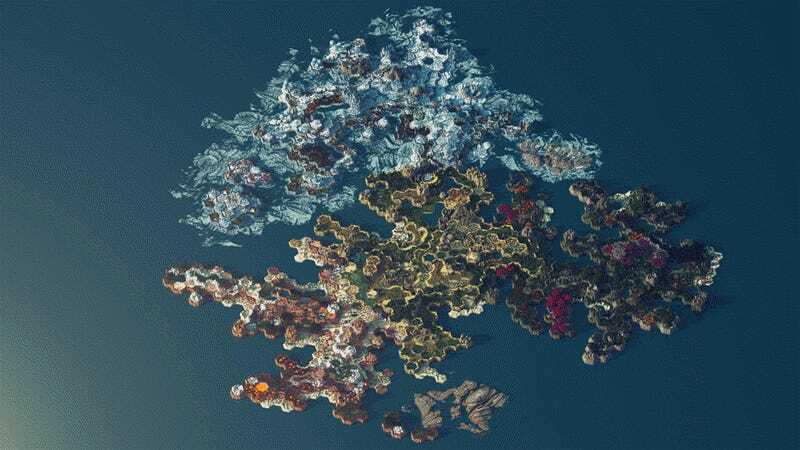 You can download the map here, either just to look, or to actually play Minecraft on it. It’s survival-compatible, so it’s totally playable (and it should last you a long time.) There’s also an album full of high quality renders here, should you find yourself in need of a nice Minecraft-themed wallpaper.